Home > Garlands & Pendants > Pendants & Ornaments > Acrylic Pendant 4.25" Long "Zelda" Set of 24 for Wedding Trees & Chandeliers! Acrylic Pendant 4.25" Long "Zelda" Set of 24 for Wedding Trees & Chandeliers! Acrylic Pendant 2 3/4" Long "Coco" Set of 24 for Wedding Trees & Chandeliers! Acrylic Pendant 2.75" Long "Blair" Set of 24 for Wedding Trees & Chandeliers! Acrylic Pendant 3" Long "Stella" Set of 24 for Wedding Trees & Chandeliers! 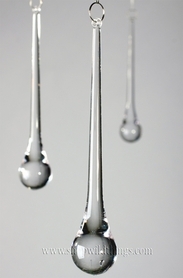 Acrylic Pendant 5.5" Long "Dewdrop" Set of 24 for Wedding Trees & Chandeliers! Completely transparent and oozing elegance from top to bottom, our "Zelda" Acrylic Pendant Set is the ideal accessory for projects that need high impact glitz with low impact on your budget! This set of 24 crystal clear pendants measure 4 1/4" long by 1 1/4" wide and they have a pre-drilled hole for instant decorating. 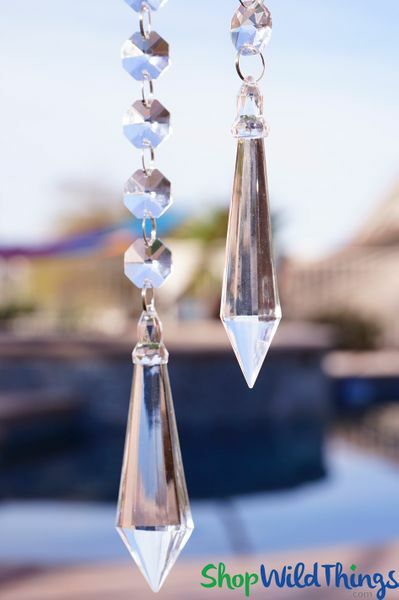 Beautifully faceted to catch every ray of light, these delicious ornaments are sophisticated and even up close, the glass-like clarity will fool everyone. Absolutely stunning! The perfect adornment for dazzling wedding and event centerpieces or for holiday glam, each pendant weighs .6 ounce so no need to worry about them weighing down or pulling on florals and branches. 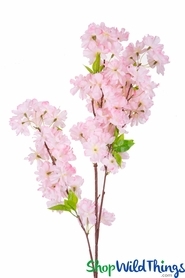 Using monofilament line or metallic thread, hang these beauties in plants or floral arrangements, decorate Manzanita Trees or add sparkle to flowering trees, wreaths and wedding arches. Other creative uses for these would be as chandelier bling, table scatter and vase fill or hanging in a window as a sun catcher. Although they look like glass, these top-quality acrylic pendants can easily be used anywhere inside or out without the worry of breaking like glass. Using jump rings, attach to the end of Garland Strands for the ultimate finishing touch or add to floral chandeliers and flower walls. 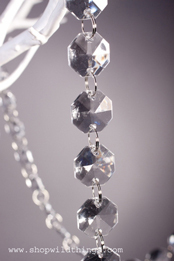 Grab a bag or 2 of these beautiful, low cost pendants and elevate your designs and projects to a glamorous new level!